I originally wrote this post last year when we were scheduled for a monster (for Virginia) snow storm. This past week weather predictions were for about 8″ of snow for Saturday. Imagine my delight when, on Friday afternoon, my doorbell rang and my fabulous “snow angels” from last year were at the door. Zach, the salesman of the group, reminded me that he and his friends had shoveled my driveway last year and he asked if I’d like to be on the schedule for snow removal for this storm. Of course I did! My favorite part was that the little entrepreneurs even raised their rates this year 🙂 Instead of $25, it was now $35 for a one-day clearing. Imagine what would happen to YOUR income if you called each of your clients, asked them to buy something else and/or raised your prices this year. There really is a lot you can learn from a few savvy (now) 12-year olds. The news for the first few days of last week was ominous – snowmageddon was headed our way. Our little Virginia town was going to get between 12-24” of snow. For a place that averages less than 6” per year, that is a lot in one storm. The snow was supposed to start Friday morning and continue through sundown Saturday. At 10am on Friday morning my doorbell rang. A quick glance through the front window confirmed that it wasn’t the Jehovah’s witnesses but rather two young boys bundled up against the already falling snow. These industrious youngsters were soliciting customers for snow shoveling. They had a great deal – $20 to shovel on Saturday, $25 if you waited until Sunday or $40 if you wanted them to clear on both days. I agreed immediately to the Saturday service. The younger boy, about 11-years old, pulled out a three ring binder. On the first page he had a list of times, every half hour, from 9am to 5pm for Saturday. He politely asked me which time I’d prefer and diligently wrote down my house number in the space for 3:30pm. At 4pm Saturday, my doorbell rang. There stood my intrepid snow-preneurs, wrapped in parkas, hats, gloves and scarves. Never mind that the wind was howling, the snow had deepened to a foot and it was laced with at least two inches of rock hard sleet. 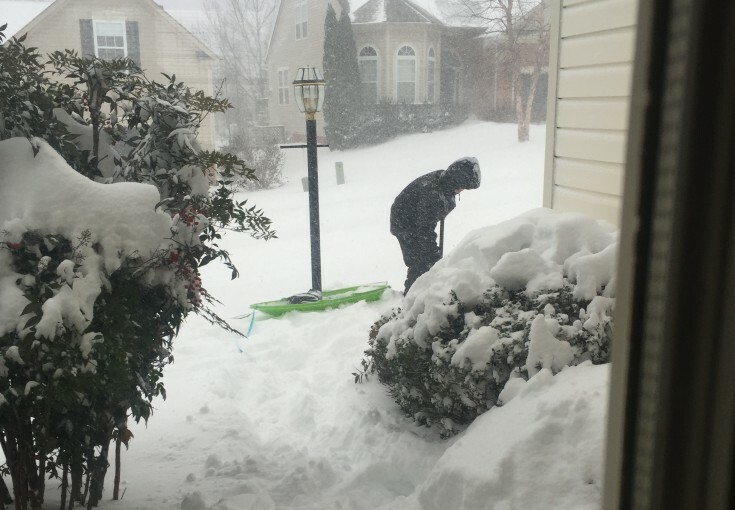 The ever-polite young gentlemen asked if I still wanted my walk and driveway cleared and I enthusiastically agreed. Then they asked if I wanted them to come back tomorrow for just $10 more. Again I accepted readily. Lesson #4: Always offer an upsell. I asked if they were busy and they said they only had seven accounts for the day but that was okay as the snow was deep and very heavy. Then the little one said something that just melted my heart. He said they had made a list of all the houses where residents said they might want shoveling. They were going to use the neighborhood directory and call all the maybes tonight to drum up more business. They had already recruited a few friends to help with the workload. Lesson #5: Follow up with non-buyers. The next morning, my now favorite neighbors rang the bell at noon to do the final clearing for me. They had big smiles on their faces and were clearly loving the sunny, warmed up weather. Lesson #6: Love what you do or do something else. What amazes me most is that these young men knew and implemented business lessons I see forgotten every day in “real” companies. Write these lessons on a card and pin them to your wall. And remember, if an 11-year old can implement them in a snowstorm, you can do them at your office any day. How Can A 520-Year Old Rule Double Your Income Faster? How Can A 520-Year Old Math Trick Increase Your Income This Year?